Item # 313693 Stash Points: 5,495 (?) This is the number of points you get in The Zumiez Stash for purchasing this item. Stash points are redeemable for exclusive rewards only available to Zumiez Stash members. To redeem your points check out the rewards catalog on thestash.zumiez.com. Step up your skate style like "The Boss" Andrew Reynolds himself, with the Reynolds Atlanta Burl Wood 8.12" Skateboard Deck. Featured in a unique, burl wood construction for excellent durability and a striking appearance, this deck is able to withstand even the heaviest of landings. Forged in Baker's "OG" shape, this board has simplistic concave that provides a stable ride from street to vert in seamless style. 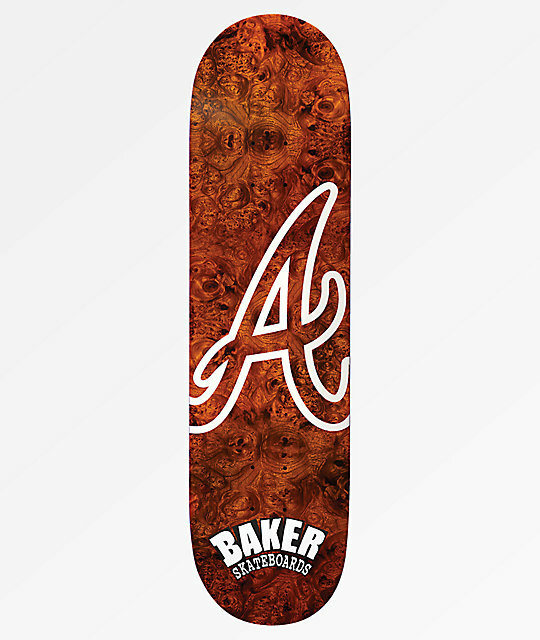 Reynolds Atlanta Burl Wood 8.12" Skateboard Deck from Baker Skateboards. Signature Andrew Reynolds pro model. "OG" baker shape, mild concave, small wheel wells.